An interview with Marco De Ceglie, Ceo of 'De Cecco USA' De Cecco’s simple yet eye-catching design symbolizes the natural ingredients of their pasta: wheat and water, sun and the Italian sky. 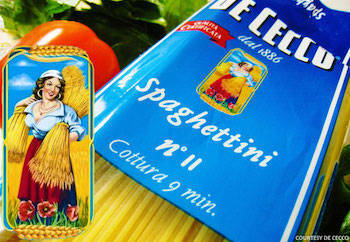 Let me start by asking you about the blue and yellow colors on the package of De Cecco pasta. They seem so simple, almost as if the package had been drawn by a kid, as if they reflected the basic, natural elements that go into your product. Yes, the colors symbolize the natural ingredients of our pasta, wheat and water, the sun and the Italian sky, and they are not only marketing logos. They stand for the passion, care, and expertise needed to make our excellent pasta. 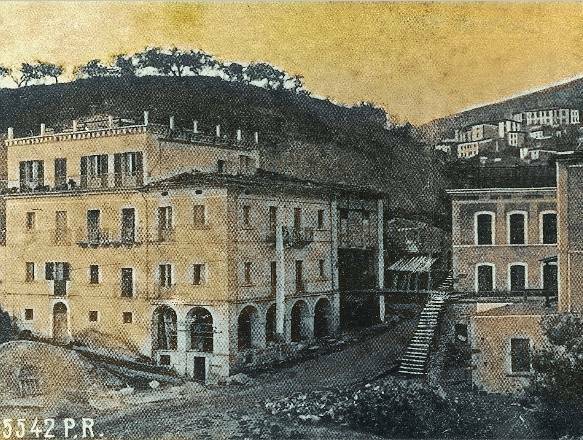 Our pasta is unique because it is the product of the De Cecco family’s traditional five-step process that has remained unchanged for more than a century. We only choose the best durum wheat. Then we mill these pale yellow grains in our own mill, keep the most valuable core and produce particularly coarse semolina. Freshly milled semolina from grano duro, or hard durum wheat (not flour, mind you, that’s not allowed in real Italian dried pasta) is immediately blended with natural, cold mountain spring water. The pasta is then shaped through state-of-the-art bronze dies and finally slowly dried for several hours at low temperatures. 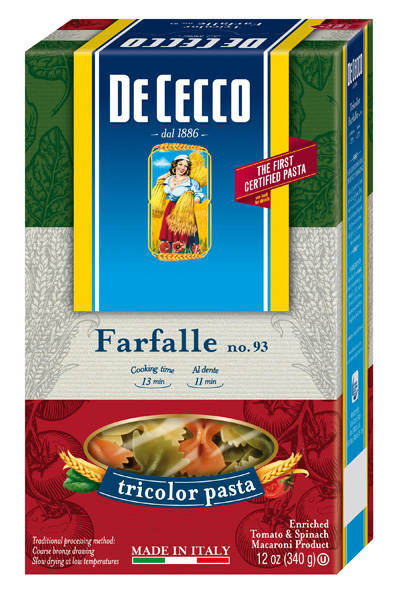 Only a mastery of these five steps can deliver the combined benefits of “natural, highly nutritional values,” “exceptional organoleptic characteristics” and “renowned cooking performance” associated with De Cecco pasta. Sounds like a very lengthy procedure. Each step requires a lot of patience. It is! And for the De Cecco family it’s crucial. They are descended from an old family of pastai [pasta makers] and are truly obsessed with quality. Take for example the process of checking gluten, which is carried out according to the original process—by “the owner’s bare hands.” Literally. It’s a ritual that has been running in the family for generations and it is one of the company’s assets. It allows us to choose the most suitable grains, with their beautiful pale yellow color. Speaking of colors... what about the blue? Any secret behind that? The blue chiefly symbolizes water. This is a very important ingredient for our pasta. We only use pure, cold mountain water from our own spring. The water comes straight from the mountains at a low temperature (<59 F) essential for “creating” pasta with a high consistency, which will ensure it stays firm while cooking. It’s no simple task to artfully mix our coarse semolina with cold water. Only very experienced pasta makers, proper masters, are able to prepare the right blends that bring over 160 types of pasta “to life.” That’s it. Spring water and fresh semolina. It’s very simple yet totally unique. In other words, De Cecco strikes a balance between industrial demands and a respect for nature and tradition. Absolutely! You can see it for yourself. Look closely at a De Cecco fusillo, a spaghetto, or a rigatone. You’ll notice that they’re slightly coarse; they are precise, right down to the pasta’s porosity. And what plays a key role in all this? The bronze drawing. Drawing is a special process that gives the pasta its shape. 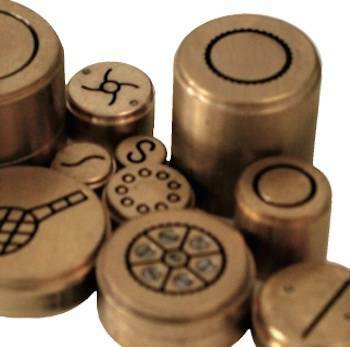 In our industry the dies can either be bronze or Teflon. The large majority of pasta makers use Teflon, but bronze creates a product more in line with “what it used to be,” because in the past all dies were bronze. Bronze drawing gives pasta that unique porosity that makes sauces and condiments stick to it. You’re right, but it is far from being a legend. It is an “all De Cecco” tradition, passed down from generation to generation. It has to do with the family’s love for good pasta. Tasters verify that plain pasta, without sauces or condiments, retains the color, fragrance, elasticity and firmness during cooking. Each penna or spaghetto must smell like wheat and it must have that typical pale yellow color we were talking about. Then they make sure that tastes right. Finally, they check the consistency and elasticity of the pasta. After the first tasting, the pasta sits for 5-10 minutes and is then tasted again. This point is essential for making sure the pasta doesn’t get soft and overcooked when you transfer it from the colander to the plate. To pass the test, it must taste like it’s just been cooked. Tasters really have the last word on quality. And you know what? Tasting is also performed by members of the De Cecco family, personally. We are a few cents above average, it’s true. But it’s a price many people are willing to pay once they learn what an excellent pasta it is, what it’s made of and how it’s made. We don’t just make an Italian- sounding pasta. We make the real thing, and we make it in Italy according to tradition. Our target is the pasta lover, the foodie, the real connoisseur. *In fact the “De Cecco people” strongly recommend that connoisseurs and gourmets try their pasta with just a drizzle of extra virgin olive oil (De Cecco’s, naturally!) 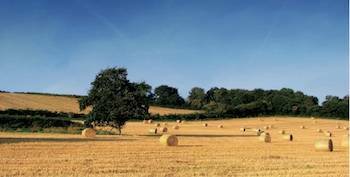 to fully appreciate the quality of their wheat. The next time your generic-brand pasta gets overcooked by a warm sauce, or “upsets” a condiment, don’t say we didn’t warn you.